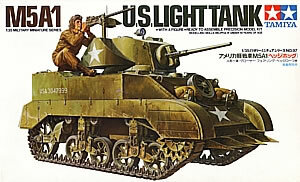 In the quest of building the "perfect" Stuart M5A1, I started acquiring items over a year ago. I had envisioned building a pair of them for a reconnaissance diorama, one as an early version and one as a late model. One tank would have its hatches wide open to expose the interior. I got a couple sets of tracks from RHPS to replace the bizarre Tamiya rubber bands and Eduard's decent photoetch set. I called over to the UK to get Accurate Armour's set of solid wheels for the late version (as well as a more extensive update kit primarily skewed towards the British version of this tank). 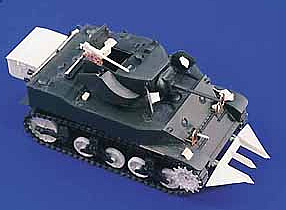 I even went so far as to order a pair of the sprues from Tamiya's M8 Greyhound which had the much more refined 37mm gun assembly and .30 machine guns. Then Verlinden Productions released separate interior and exterior sets. The former supplied an all-new, highly detailed turret that is supposed to be more dimensionally correct and promptly eliminated the need for the Greyhound parts I'd purchased. 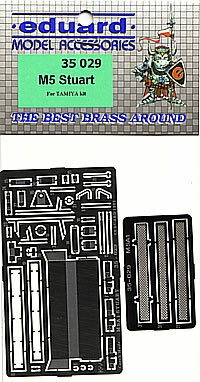 The exterior set, however, did not address the other most egregious error in the Tamiya original -- the miscalculated rise of the rear deck over the engines. So I did not opt to buy the exterior set, concluding that I would have to correct the deck myself. 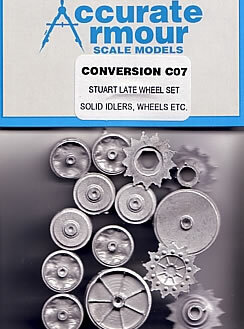 This problem appears to be solved with Legend's update for the Stuart and I can offer some initial comments, particularly in comparison with Verlinden Production's recent interior and exterior sets. Depending on how far you want to take the original, using these sets together can be somewhat of a mixed bag. Not surprisingly there is some duplication between products, and the corrections do not necessarily accommodate one another. Consequently, there is still no comprehensive fix to this kit, and in no time flat you can spend upwards of $80 to bring up to snuff a kit from the 1970s that retails for around $12 when it's on the shelf. It's been rumored that Skybow will bless us with a newly tooled M5A1, sometime after their M3 tanks come out. Based on Skybow's remarkable series of Dodge offerings and the leap in quality over their Italeri predecessors, it's easy to see why many people want this rumor to turn to truth. But for those of you who can't wait, the following should give you a good guide to three of the major update kits. 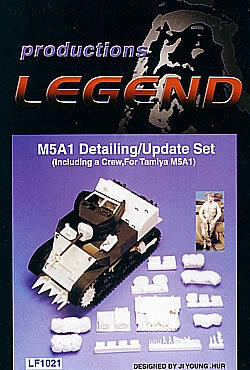 Though it's nearly completely concealed in the product photo, Legend offers a complete lower hull that is a direct copy of the Tamiya part. Unfortunately, the inside floor is unevenly ladled with extra resin. This is the first resin hull I've seen, so I don't know if this was for strength or just sloppy. The most significant problem is that it means you can't install the VP transmission and front seats without grinding it out. Granted, you need to grind out the tabs holding the batteries in place in the rear of original hull, but a less than perfect job will be concealed by the turret flooring and other items. There are a few improvements Legend has made to the hull: the shape of the nose appears to have been reworked somewhat raised serial numbers added (upside down - is this correct? 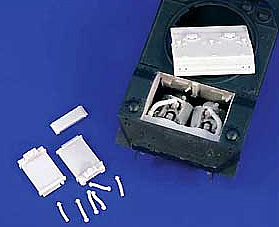 ); bolts are provided on the sides of the transmission cover; a bolted plate and some patching has been done to the motorization holes. The exhaust vent on the underside of the rear wall is closed off where it should be a mesh screen. It doesn't appear that any other parts depend on using this resin hull, so if you want to do add the VP interior you need to revert back to the Tamiya hull and make the corrections Legend has provided on the resin hull. Legend provides correctly shaped pieces for the unique lifting hooks (?) on each side of the hull; you just need to scrape off the deformed representation on Tamiya's original. On the positive side, Legend has changed the rise on the back deck; without adequate references I can only suggest it appears to have corrected the problem most often cited about this kit. It appears in every detail to be a copy of the original - tie downs, grab handle placements, filler caps -- with just the alterations in the rise over the engines and a change in the size and screening of the diagonal air vent. The rear deck is a single piece of resin that extends down to the sides of the superstructure, so you'll need to saw off the back portion of the Tamiya kit. The underside is hollow, but it appears it adjustments will need to be made if you want to include VP's engine set. The new glacis from Legend is the same size and shape of the original Tamiya piece, but they have adjusted the features, moving the air vents (? ), deflectors and mounting positions for lights and guards down more toward the front of the vehicle. There are no driver levers or other features for the underside of the glacis except for a new .30 machine gun; VP provides a new gun and more extensive mounting. Legend provides a single piece of resin sandbags and spare track (properly configured), an option that covers the glacis - and these changes. There are just a couple improvements for the turret: a new cradle for the side-mounted .30 machine gun (but no new mount). The hatches are duplicates of the Tamiya hatches in size. New driver and machine gunner hatches have the raised lip on the underside. The turret hatches offer much finer detail on the underside than the originals - included molded on grab handles with a very thin bit of flash to remove. VP's hatches are sized for their turret - a tad larger than Tamiya and the Legend parts. Legend provides new periscopes for four hatches; VP has new hull hatch scopes in their exterior set. New textured gun mantle is the other significant improvement to the turret from Legend. VP's interior set provides an all-new turret that is supposed to be more dimensionally correct and there is a wealth of detail inside, including a full gun breech and mechanisms. Neither company offers a new barrel for the 37mm gun; indeed, the best looking barrel comes with Tamiya's M8 Greyhound set. All three update sets include new .30 machine guns (Legend's barrels were warped). Legend and the VP interior set have nicely molded but different radios for the turret bustle; apparently there were three different options in real life. Both companies offer solid spoked drive sprockets; VP uses the erroneous Tamiya track so there may be spacing problems between the wheel's teeth. It remains to be seen if the Legend sprocket is an improvement. Legend does not provide solid rear idlers or road wheels as VP does on their exterior update. There have been reports that Accurate Armour's white metal wheel set is too wide for the RHPS tracks, and the sprocket teeth don't mesh correctly with the track. The Cullin hedgerow cutters can be found in two different styles in the Legend and VP exterior sets; Legend is a more detailed version of Tamiya part. Legend's set includes two jerry cans, a couple crates and four machine gun ammo boxes, some tarps and tow line looped ends. 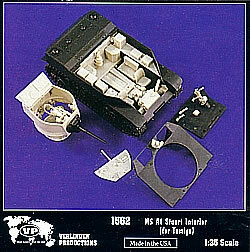 There is a tanker figure standing with his legs crossed; he is very small in size, more like current Tamiya figures than Verlinden. From VP: rear equipment box, tools and photoetch brush guards and cradle in the exterior set; the usual assortment of GI gear added to the interior set and perhaps to the exterior set as well.